If you need to lodge a partner visa application in Australia and you currently hold any bridging visa or you currently do not hold any visa at all, then you will need to satisfy the Schedule 3 requirements for your partner visa application. This generally occurs if you are in Australia waiting for a Tribunal appeal hearing or Court hearing in relation to your visa refusal or cancellation, or if you overstayed your prior visa and you are currently unlawfully in Australia. In this situation, you are allowed to lodge a valid partner visa application while you are in Australia as long as your prior visa refusal was not a partner visa refusal. Generally speaking, in order to satisfy the requirements under Schedule 3, you will need to demonstrate that there are ‘compelling reasons’ that affect the circumstances of your application (‘compelling reasons’ requirement). There are no specific circumstances or events defined under the law as ‘compelling reasons’. Whether the circumstances of your application are considered to be compelling is at the discretion of the case officer that assesses and decides your application. As stated in the above example of the Department’s correspondence, visa application and circumstances are considered on a case by case basis. If you currently do not hold any visa and you are unlawfully in Australia, then the Department will also likely ask you to provide an explanation in relation to why you overstayed your last visa and became unlawful. For example, in the scenario given earlier, it is reasonable to accept that compelling circumstances exist to waive the Schedule 3 criteria if, for reasons beyond the applicant’s control – such as severe illness or incapacity – the applicant was prevented from regularising their status in the years they had been unlawful. Will the Department approve my application? You are allowed to rely on circumstances that occur after the lodgement of your visa application, as the compelling reason or a further compelling reason to satisfy this requirement. This includes events or circumstances that arise during the Department’s processing time, and the Tribunal’s processing time if you need to appeal. You are not limited to circumstances and facts that existed at or before the time of lodgement of your visa application. Since the ‘compelling reasons’ requirement is assessed on a case by case basis, you can lodge an application and argue that any circumstance with a genuine relationship is compelling. However, the Department will generally refuse applications that are not consistent with their above guidelines. Hi, I have applied for remaining relative visa as two of my siblings are in Australia and one in Europe. my parents were diseased. i have got the visa refusal and applied for AAT review. is there any chance i will win the AAT? if not what are the next avenue for me? 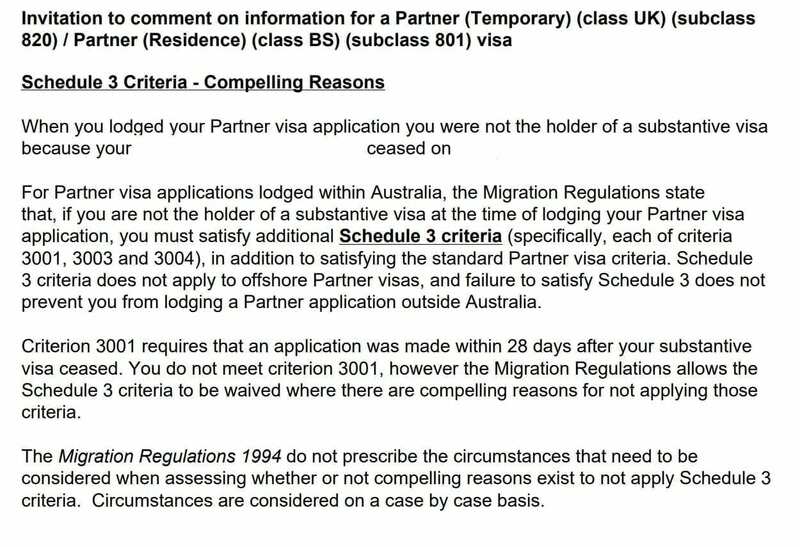 will i be able to apply for partner visa while i am onshore? Unfortunately I can’t provide advice about situation just based on your comment information. Please see Contact Us page and in relation to our Consultation Service – feel free to contact us if you need advice in relation to your options. I am a retired exarmy Australian citizen I want my partner who is pregnant with my baby to come and live in Australia with me . I am on a army pension and don’t have $7000 dollars Wich is ridiculously insane.We have know each other since the 15 November 2018 I have just spent 2 months at her home and village and we have been for a ultrasound and have twins I want medical treatment eg ultrasound is there a waiver for fees or different visa to use. Unfortunately there is no waiver available for the fee – the cost of a partner visa is fixed.